This week I made some of the best rolls in the entire world! 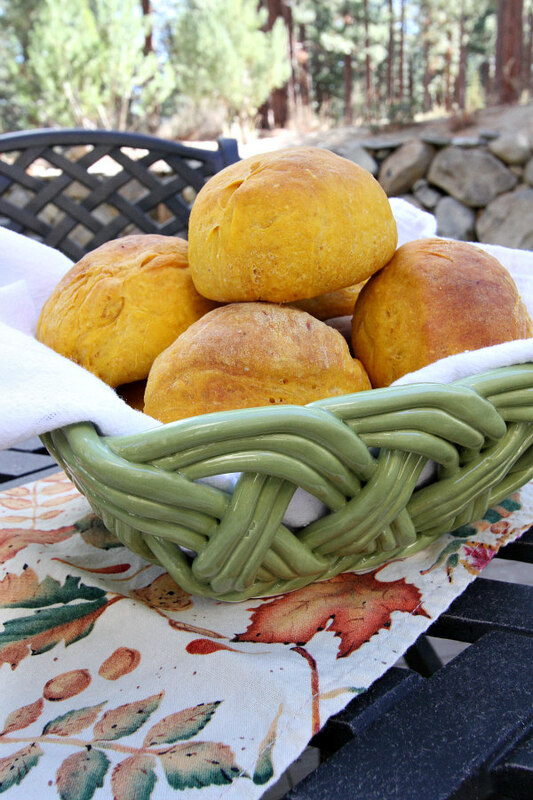 I made a Thanksgiving-themed dinner roll, also called Pumpkin Dinner Rolls. 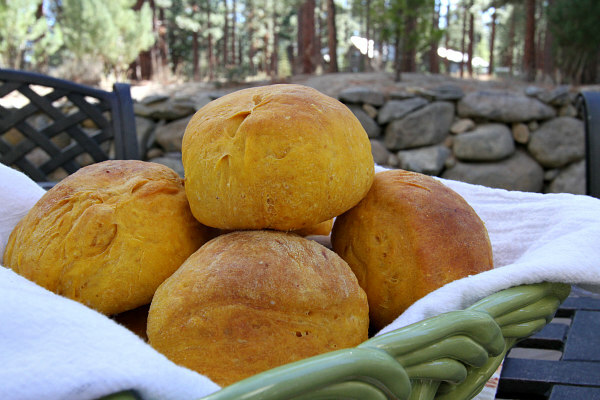 These dinner rolls are awesome because they aren’t overly pumpkin-tasting. 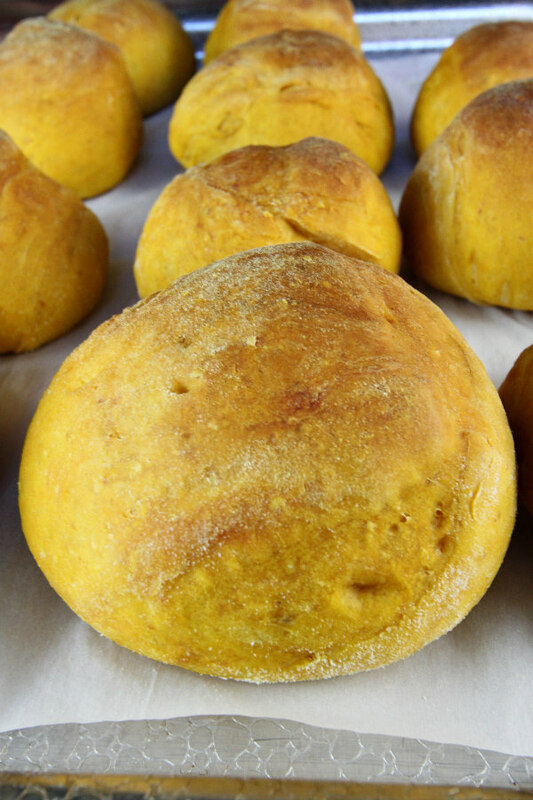 The perfect ratio of pumpkin to dough… just enough to make them tender. The recipe comes from a new cookbook that my mom had from Donna Currie: Make Ahead Bread- 100 Recipes for Melt-In-Your-Mouth Fresh Bread Every Day. There were a lot of recipes that looked good in this book, but this one looked the best! When the rolls rise in the oven, they reveal their true beauty. They have a very nice consistency, even for the next few days after making them. When I made these rolls, I had one specific idea come to mind. It was to use these rolls as mini-sandwiches using leftovers from Thanksgiving. Pretty genius right? So basically, all of that yummy turkey, stuffing, and cranberry sauce doesn’t have to go to waste. 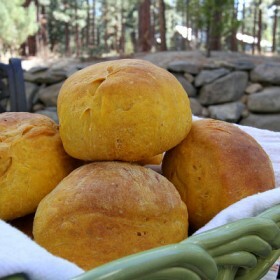 Forget the holiday… I can’t wait until after Thanksgiving to eat sandwiches with these rolls! Please enjoy these rolls as much as I do, and maybe even more! These would be great with your Thanksgiving dinner! 1. Day one: Line a baking sheet with parchment paper. 2. Combine all of the ingredients in a stand mixer and knead with the dough hook until smooth. You can also mix the ingredients in a large bowl, using a hand-held electric mixer, then knead by hand. 3. Cover the bowl with plastic wrap and set aside to rise until the dough has doubled in size, about 1 hour. 4. Flour your work surface and turn out the dough. Divide it into 12 equal pieces and roll each piece into a ball. Arrange the balls on the prepared baking pan and cover the pan with plastic wrap. Refrigerate overnight or up to 24 hours. 5. Day 2 (baking day): Take the pan out of the refrigerator and heat the oven to 350 degrees F.
6. Remove the plastic and bake the rolls until nicely browned and the internal temperature is 205 degrees F. on an instant-read thermometer, about 30 minutes. Transfer to a wire rack and let cool. 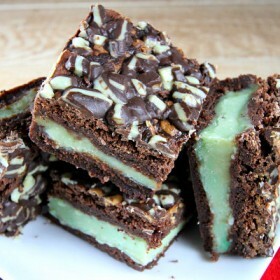 These are on my list to bake for the holidays! Totally genius for Thanksgiving leftover sandwiches! These look awesome. Just posted them on Facebook for my brother as he’s the baker in family. Happy Thanksgiving! 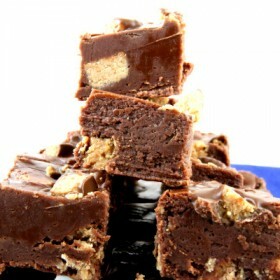 Look forward to making these. Hope you and your family have a wonderful Thanksgiving. Looks like you did it again. Beautiful yummy-looking rolls and great pics. I bet your followers enjoyed this one with their Thanksgiving dinner.